Mom and Dad Chung came to visit me in Sarasota about a month ago for a few days to escape the Chicago cold for summery, sunny Sarasota. In their four day trip, we had seafood at almost every meal. On their last day, Mom Chung said, I don't even wanna look at seafood anymore. One of our favorite meals was at a local favorite: Owen's Fish Camp. Nestled in the artsy district of Burns Court, Owen's Fish Camp is housed in a 1920s cottage and decorated with vintage advertisements and quirky fishing memorabilia. Obviously, seafood is the star of this restaurant. When I went with the parentals, we ordered a snail appetizer that was heavily doused in garlicy goodness on a light bed of grits. I've had some snails in my lifetime but never as good as these! They were tender, not scary and delicious. This is def not a date night appetizer unless you like the aroma of very garlicy breath on your special friend. Dad Chung ordered his second steamed mussels meal of the week. Owen's mussels definitely was the winner of that mussel war. They were fresh and tasty. I am a fan of Owen's but it wasn't until my second trip there that I was convinced of its appeal. 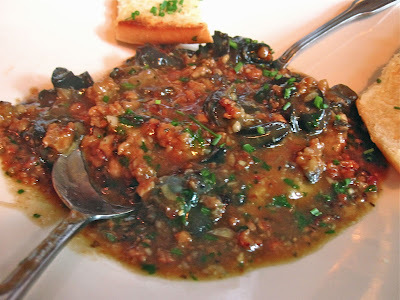 My first encounter was good because of the snails but not-so-good because of my shrimp and grits. Wanted more grits and less shrimp. I knew I wanted to go back and give Owen's a second chance when I saw the table next to ours that had this HUGE bucket of seafood that looked oh-so-good. 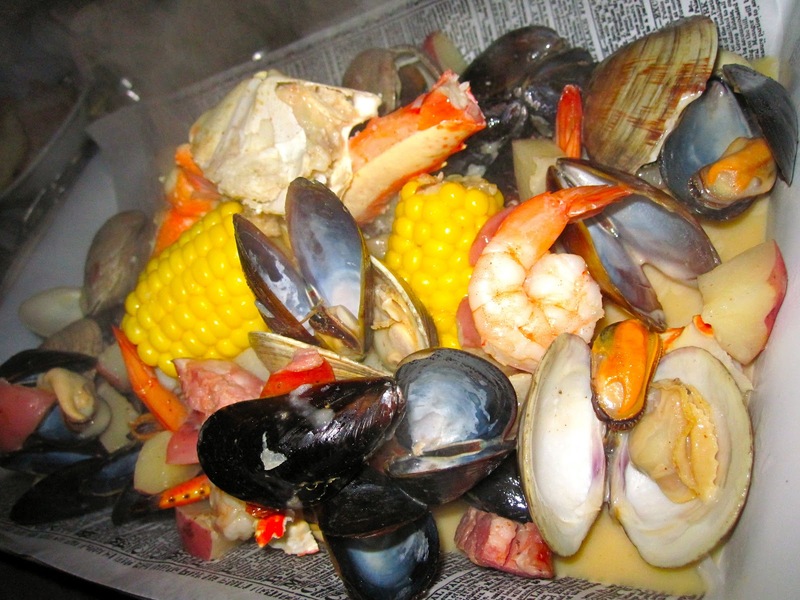 Huge bucket of seafood=Low Country Boil for two crab legs, shrimp, mussels, clams, andouille sausage, potatoes and corn. 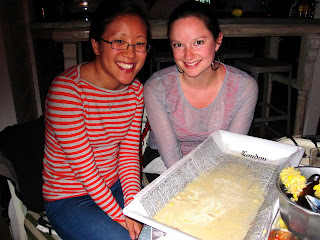 My partner-in-crime for this huge bucket of seafood was another tiny friend, Erin. We both may be small in stature but not small in appetites. With a tiny bit of help from other friends, we managed to finish the entire contents of our bucket. Our waitress was pretty impressed. I was happy with a full belly of buttery seafood yumminess. Every item in the bucket was amazing. The seafood was so fresh and tasty and I guess anything with butter is destined to be pretty great. Oh and I forgot to mention, friends and I all partook in the eating of raw oysters for the full seafood experience. 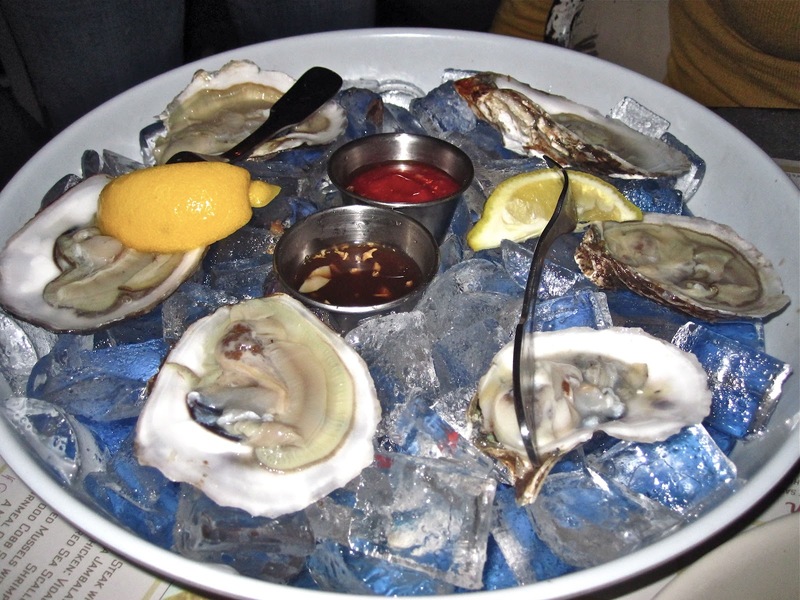 I've never been a huge fan of raw oysters but I bit the bullet and tried them. Not as slimy as I thought they'd be and actually kinda good (when doused in some tasty gingery sauce).